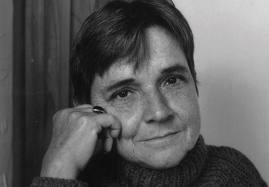 Adrienne Rich has just died at 82 years of age. That is a good long life, and it is truly inspiring how active she remained until the end, publishing and mentoring so many of us who follow in her path. Although she was primarily a poet, there is an essay of hers that has remained very powerful for me, being the autobiography junkie that I am. It’s “Notes Towards a Politics of Location,” the one where she talks about growing up as a Jew in the American South, and how she always felt like such an outsider. It connects very much with her general recommendation for women, that we consider our outsider status a blessing, rather than a curse. That we continue to see things with outsider’s eyes, rather than assimilating to the dominant mode of seeing and being. This message has resonated strongly with me because I have always felt myself to be an outsider. It doesn’t seem to matter which group I am with, or how long I have been affiliated with them, or even if I am, in name at least, the principal of that group. I am the perennial outsider. And thanks to Adrienne Rich, I no longer feel that as a handicap or a slur. Rather, I wear it as a badge of pride. Rich was someone who could have chosen to take her privileged status as a white American Jew and spend her life comfortably at the country club. Instead, she chose to ally herself with Black Americans (notably Audre Lorde), gay Americans, and anyone who needed a powerful and articulate ally. Alliance is a tricky business. A would-be ally from a more powerful social class needs to be very careful to offer help without coming on too strong; to use one’s power to open up spaces for one’s allies to speak and act independently. It’s not about us—it’s about them. Adrienne Rich made it look easy, but it’s not. Three of my most important mentors have now passed on: Audre Lorde, Gloria Anzaldua and now Adrienne Rich. Such a huge legacy to try to continue and move forward. Sisters, I promise each of you that I will do my best to keep your spirits alive.